So what’s their secret behind conceding so few goals? There isn’t one. Just a brilliantly well-drilled man-orientated defensive scheme with each and every player carrying out their defensive duties to the absolute utmost. This article will analyse their defensive schemes in each third of the pitch that have worked so well for them this season. I’ve used examples from four different matches, showing that they can defend just as competently playing against a variety of opponents and systems, while using a variety of systems themselves. The two systems Atleti change between are 4-1-4-1 and 4-4-2. There isn’t a clear reason for why a system is chosen for a particular match but they tend to play 4-1-4-1 in slightly tougher matches while they use 4-4-2 in the matches they are more expected to win. Below are both of those shapes, with the players you can normally expect to be starting in each position should there be no injuries or suspensions. Atletico Madrid look to restrict the opponent’s ability to play in all areas of the field. They look not just to apply pressure in the final third with the aim of stopping the opponent from playing, however, they also use a variety of techniques to win the ball in the opponent’s half, and then counter attack. Rayo throw the ball back to their centre-back. Atleti’s press moves up a line. Fernando Torres moves towards the ball player while cover shadowing the midfield option. Griezmann moves up, Carrasco and Niguez move up tight to Rayo’s pivots. As Torres moves to press the goalkeeper, he positions his body in a way to cover shadow two Rayo players. Niguez is tight to the midfield option, and Griezmann leaves Rayo’s LCB free, but is in close proximity to press him. This forces Rayo to pass it out wide to this man. The ball is forced wide where Atleti can get 1v1. Atletico are famously good at pressing in wide areas, using the touchline as a defender in itself to block of 180 degrees of the ball carrier’s passing range. The Rayo player attempts a ball forward which is intercepted by Atletico deep into the opposition’s half. Griezmann is pressuring the first man, while cover shadowing his option up the line, the midfield option is blocked by Koke, Torres prevents a switch of play by staying tight on the right centre-back. The ball is,on purpose, forced to the spare player. …The ball is played into midfield and the Rayo player has no room to turn, all options are deliberately blocked apart from the left centre back. Atleti very compact midfield four, blocking any pass or combination of passes beyond them. The left-centre back is isolated. And Atleti should be able to press him and win the ball from him. However he manages to find a forwards pass due to poor ball pressure from Atletico. Atleti’s manic pressing is triggered, making sure Rayo don’t get out of their half. The ball is played wide and Atleti have good local presence, with the ball carrier being put under pressure. Here, we have a similar situation, there is a circle of Atletico players, with one free Rayo man in the middle. The ball is played to the free man and Torres forces him towards Atletico’s compact midfield, where he is pressed from all angles. Atleti win the ball and can counter attack. This zig-zag midfield four we can see in the first image is deliberate. It allows them to cover horizontal and vertical angles on the field more effectively, and gives them a layered pressing shape. The grid shows, just as how Juego de Posicion would in the attacking phase, this staggering allows them to cover space more efficiently. As the ball moves wide, it’s Niguez, the RCM that moves to his left to cover Rayo’s pivot while Oliver Torres drops back and holds space, preventing a long, low pass in his area. This allows them to offer an intense man-orientated pressing style, while also being structurally sound. Torres turns and cover shadows the backwards pass. One negative of a man-orientated system is that it can be prone to one-twos. Rayo attempt the one-two however Niguez is tight enough to his man to put him under enough pressure to force his pass out of play. Atleti throw-in. Vietto is covering the midfield man, forcing the backwards pass, however has his body position and momentum so he can reach the centre back when the ball is inevitably played to him. The body shape of Carrasco, the Atletico player closest to the ball, is forcing Benfica backwards. Benfica move the ball from their second line, to their first line, so Atletico move up a line accordingly. Vietto moves up onto the ball carrier, and Koke moves onto the man Vietto has left. Atletico know that the ball will be switched across, so move quickly to get into their pressing shape on their left side. Saul moves forward to the new ball carrier. And Gabi, the DM, moves up slightly to fill the space he has left. The ball carrier has credible passing options to his left and his right. 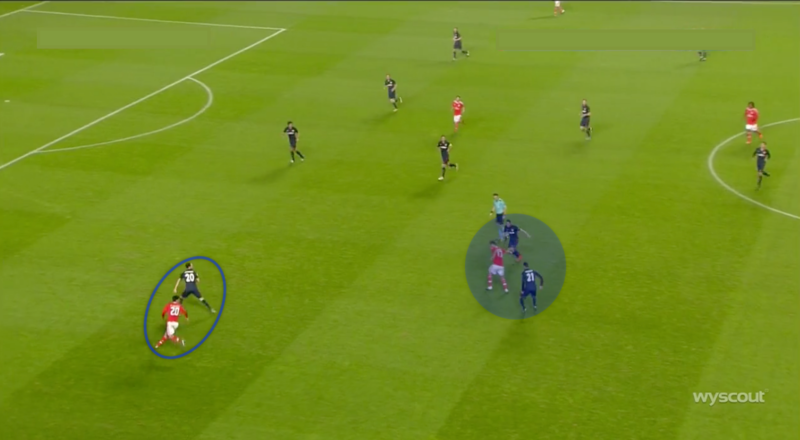 Atleti’s man orientated four-man midfield are well prepared for this, the blue arrow shows what man they would look should the ball be shifted to the Benfica right-back, the white arrows show where the player would go should the ball shifted to the other side. 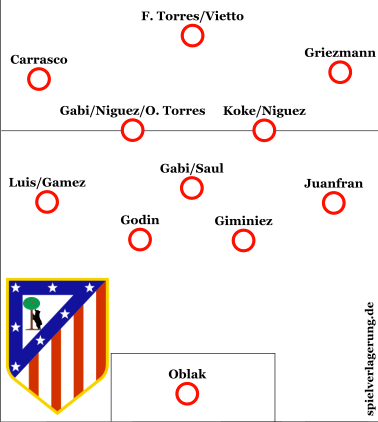 Atleti move into a 343 shape with the dotted lines showing Griezmann and Luis moving out of their original lines. The opposition player opts to go for a pass up the line, which is intercepted. If he chooses to play the ball inside, the Benfica player would have been put under immense pressure from all angles, as we have seen previously. In the middle third, Atletico maintain their intense man-orientated pressure however have more of an emphasis on structure and forcing the opposition into less dangerous spaces. Atletico’s 4-4-2 shape with quite a fair bit. As the ball gets moved into the middle, Atletico move into a compact central shape and Niguez moves forward to press the ball. This run forward by Niguez blocks any central pass while also giving Atleti a pentagon shape as shown above, forcing a short ball wide as the ball-carrier doesn’t have time to play a long high ball. The ball is forced wide and Atletico use some tight 1v1 marking as well as intelligent use of the touchline to win a throw-in. Atletico always have brilliant local compactness, with many players in close proximity to the ball in the area around the ball. They also have all been taught to defend brilliantly 1v1. They use clever body positioning to lead the ball-carrier into dead ends, they hardly ever make a slide tackle, and they know the correct time to put a foot in to steal the ball. Atletico’s man orientation leads them to have a horizontally uncompact shape. We can see O. Torres dropping back into the channel with his man. This shows that structural compactness can be sacrificed for solid man orientated defending against teams like Rayo who will take any chance to switch the ball into spaces on the other side of the pitch, using their expansive shape to do this. Rayo pick up the ball in their own half, Atletico immediately force the ball wide. They do this with pressure coming to the ball from Atletico’s right, as well as vertical passes being cover shadowed. The only ball available is one to feet, meaning the player receiving the ball will be static when he receives it, giving the Atletico players chance to get tight to him before he can move it on. This is exactly what happens, the wide man receives the ball and is isolated, with his options being cut off. The player manages to wriggle out of the wide 1v1 and play a backwards pass, however the new man on the ball cannot turn infield due to Torres’ body shape while pressing him. He is forced to play into an area overloaded with Atletico players. He can’t find a passing angle and the ball runs through to a navy blue man. Atletico are in a 4-5-1- shape with a V-shaped midfield 5. This means that if Rayo attempt to make progress through the wingers, Atleti will be able to stop them around the halfway line whereas a flat five would allow them to get higher up the pitch in their build-up. If the opposition choose to look centrally, in the middle of the V, they will be put under pressure from several angles and their angles will be blocked out by a circle of six Atleti players. Malaga play wide and Atletico have immediate presence on this side of the field. Again, local compactness but overall horizontal uncompacntess. Malaga cannot progress up the flank. Vietto isn’t close enough to Malaga’s pivot. Niguez reads this and moves up making sure Malaga’s pivots don’t receive the ball. 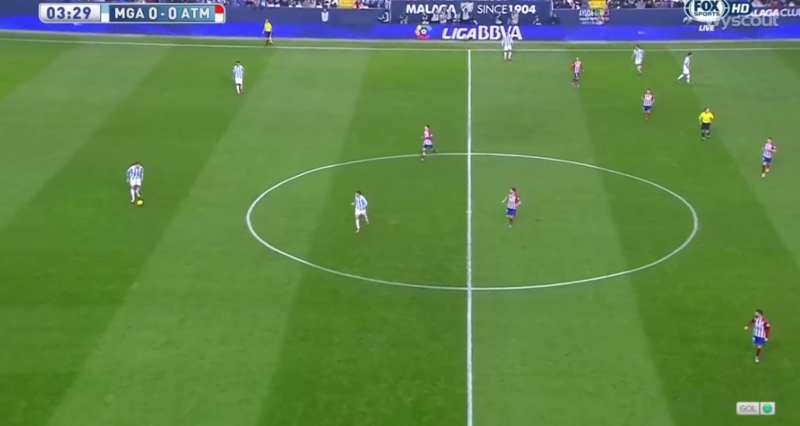 Atleti’s lack of horizontal compactness means that Malaga can’t find space on the other side of the field by switching. Malaga go back to their left side, again they have no joy due to mild pressure on the ball carrier, as well as their immediate options being tightly marked. Malaga come back again, but this time Niguez has blocked the switch and Malaga don’t seem keen to use their goalkeeper in build up. They are forced back over to the left flank. Notice how Atletico’s pressure as pushed them back about 10-15 yards from where they were. Koke’s press on Malaga’s LCB isn’t ideal as he doesn’t cover shadow the man behind him effectively. 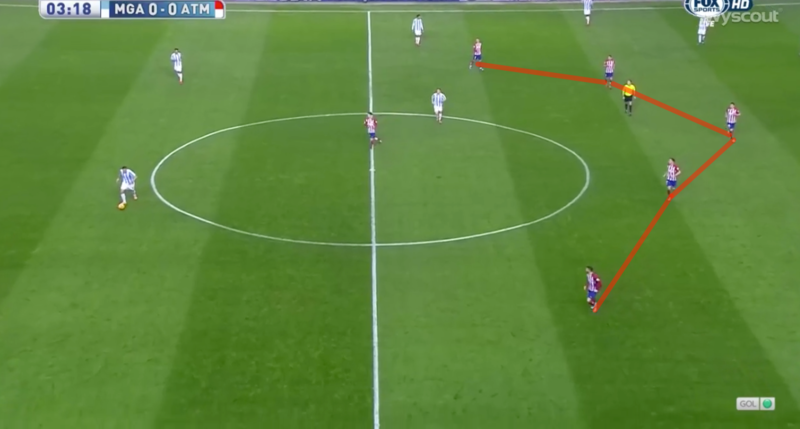 For a a lot of teams, this first pressing line being broken would mean disaster however Atleti have three players occupying the right flank behind Koke. The Malaga player looks for a long, low pass however it goes out for an Atletico throw. Local compactness. 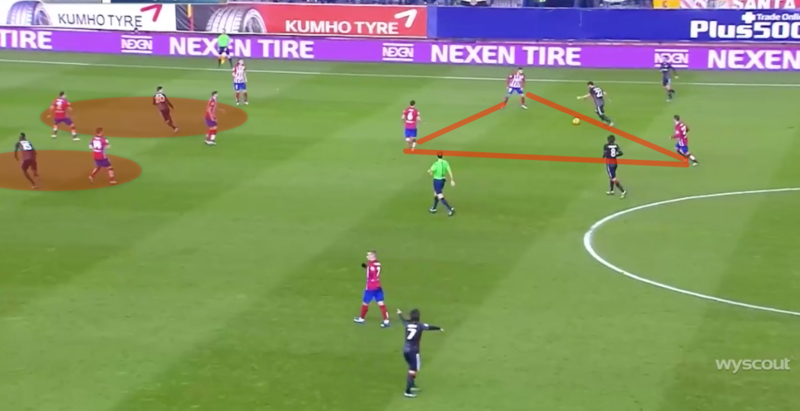 Similar to their middle third defending, Atletico look to occupy the area and the men near the ball while also maintaining a good overall structure. Atletico rarely have to defend in their own third as they usually restrict the opposition further up the pitch. Opposition teams are forced to use very quick, one or two touch attacking moves in the final third vs Atletico. Atletico are in a 4-1-4-1 shape with Gabi holding space in between the lines. As the ball is played forward into the final third, the player receiving the ball is pressed from both sides. Also notice Juanfran choosing to stay tight to his man, rather than being part of a flat back four. The Benfica player can turn and play back into midfield. Atletico have immediately cancelled out Benfica’s options on this side of the pitch. Benfica try another pass into midfield. The ball receiver can immediately by covered by two players. Benfica manage to get the ball into the space between the lines. The new ball carrier expereicne pressure from all angles, Atletico apply maximum pressure to the ball in their own defensive third. Atletico’s defensive line is relatively deep, meaning it is almost impossible for a through ball behind the defence to be played. Benfica aren’t playing with width, so neither do Atleti. When the ball gets into the final quarter of the pitch, they make sure they are both horizontally and vertically compact in central areas. Atletico’s comapct shape forces Benfica wide, Atleti now shift their presence to the right halfspace and flank, as this is where the ball is. Benfica are forced back and Atletico can steal the ball due to some good 1v1 defending. When all else fails, Atletico prioritise the ‘Zone 14’ central space. Ateltico throw as many bodies as possible into the area with the ball, they do this by shifting their two lines of four to the right, with ever increasing spaces between players as they move from ball side to non ball side. For example, Giminez is closer to Juanfran than Godin is to Giminez. This ball-local overload restricts the opposition’s ability to play out of this area. One short pass is made, Atletico’s local compactness combined with Malaga’s poor possessional structure means he has nowhere to go, the Atletico man sticks tight to him and he cannot turn, Gabi tackles and Atletico can counter attack. Griezmann follows all the way back, no player is given any time on the ball, their man orientated scheme dictates that the closest player to the man on the ball, stays with the man on the ball until it moves on. Getting this type of defensive dedication and intelligence from dynamic attacking players such as Griezmann is key to having a defensively solid team. Compare this to the defensive work-rate of a player like Hazard for example. Also, Atletico again have a 3v2 on the flank where the ball is. Atletico win the ball out. Athletic Club are more cross orientated and looked to attack Atleti with long balls from deep. To prevent this from being successful, we can see Atletico have dropped their central midfielders back so Athletic’s forwards are marked from front and back. Atletico Madrid are serious contenders for both the Primera Division title and Champions League. This achievement cannot be underrated considering their net £12million spend over the last four years. Simeone has continually proved that well-structured, high intensity defending can be used to propel a team to the same level as teams with much more world class attacking talent. Atletico also show that training players to be able to defend effectively 1v1 can give them the qualitative superiority necessary to implement a man-orientated defensive system very well. Their local compactness without sacrificing their overall pitch coverage will make it very difficult for teams like Bayern Munich, who enjoy switching the ball into space on the other side of the pitch, to score at the Vicente Calderon should they be drawn against them in the Champions League knockout stages. (1) In Example 1, picture 2 isn’t exactly what’s happening. Torres can’t see behind him and is doing his best to split the gap between the player out wide and the player inside. If the goalkeeper was better with his feet, he can actually play either of the two players and make Torres’ pressure entirely negligible. Also, Griezmann is allowing the Rayo CB to get the ball out wide on their left side, in order to protect the middle of the pitch. In the event that the goalkeeper plays the ball first time into the free defensive midfielder, Griezmann, Carrasco, and Niguez are reasonably well-positioned (ie. in a triangle) to deal with the threat of the two central/defensive midfielders being able to turn and by pass the the four Atletico players who have stepped higher up the pitch. 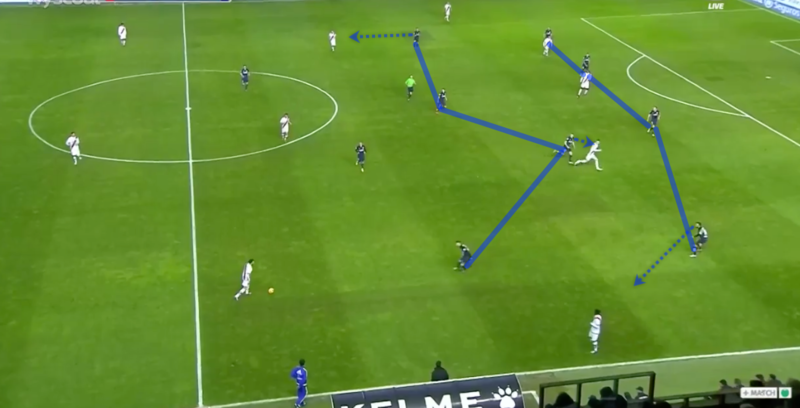 (2) Much of Example 2 is created not through Atletico’s ability, but by Rayo screwing it up. Picture 3 is important because Rayo have managed to get the ball into the feet of a CM who is given the ability to turn. Rayo’s mistake here is that the left-back is useless. If he is closer to his goal, the LCB can also drop and they can absorb the pressure from Atletico more easily (likely scenario is the ball goes CM->LV->LCB->GK->RCB etc.). The left-back’s other option is to push higher as that is where the space is. 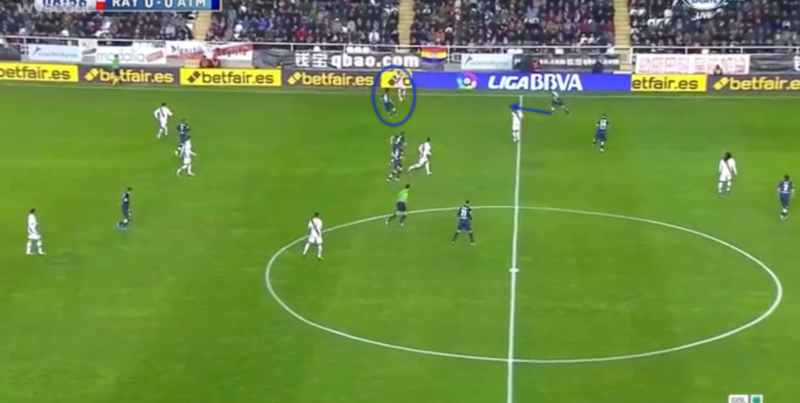 By doing so, he also forces the right-midfielder to choose between Rayo’s LB or LCB. With the LB pushing higher, the LCB also has more space and options once he gets on the ball. This problem is highlighted in picture 4 because the LB offers nothing once the ball is given to the LCB, and actually acts as a detriment because the Atletico player is managing to cover two players, the LB & the LCB. The best option for Rayo here is to switch the ball via GK. (3) For Example 3, the zig-zag midfield orientation is irrelevant. What is important is the ability to let the ball into players that can be closed down. In picture 1a Atletico are suffocating both of Rayo’s CMs. (4) Picture 4 shows less of Atletico’s ability and more of Rayo’s inability. The player out wide receiving the ball has no central option and so is forced to either play the ball up the line or take the Atletico player 1v1. The Rayo player with his hand in the air should basically be standing beside the ref. In doing so, he can receive on his right foot and open up the field. what software or program do you use to make your analysis diagrams? Thank you for your in depth explanation of how ATM plays their game, I was intrigued by how little goals they conceded and your article has done a great deal in my understanding towards their game. Thanks for the nice comment. My recent analysis of their win over Real has a bit more about how they defend. First off, this is hands down THE place to come for football analysis. It’s my first stop whenever I have some spare time on my hands to do some reading about the game. I’ve noticed some parallels between Leicester City under Ranieri and the way in which Simeone likes to set up his Atletico team. Admittedly, Atletico are far more advanced in terms of their ability to carry out the defensive concepts the side is tasked with but I see Leicester are doing similar things in terms of where they prefer to position themselves defensively and how they use space offensively. Perhaps it’s less similar to the Atletico that we are seeing this season but I definitely feel as if there are things in common with Atletico side of 13/14 or 14/15. I’ve really liked what u did. Man, this is fantastic, really. Really well spot on analysis. You’ve made me admire Simeone more and more. Imagine if he can deliver some titles? With 12M spent only? Would be amazing. My only advise would be to put the names on the images. I’ve read from my phone so I dunno if in the of we can see the players names on the shirts but with some drawing names it will be a lot easy to spot things. Thanks for your kind words Arthur. I agree, Simeone is an incredible coach. Thank you very much for your advice, I’ll take it into consideration in the future. Terrifying analysis, probably on par with professionnal level. Can you please let us know how much time you spent on it? Aha thank you, hopefully one day I can use these skills in a professional environment. I’m a huge procrastinator so maybe I spent around 20 hours on this. If I worked flat out, maybe I could do it in 7 or 8 hours. In the first example of Final Third Structure, you refer to a certain part of the pitch as “‘Zone 14’ central space”. I was wondering if you know of an article or resources on splitting up the pitch into zones? I have heard that Pep uses the zones extensively. Love this article. But since I am a Benfica fan, I saw that game between Benfica and Atlético Madrid in Estádio da Luz, Lisbon. In the chapter “Final Third Pressing”, example 4, picture 4, the 3-4-3 structure by Atletico, in my opinion is very stretched. For example, if André Almeida (the guy with the ball) passes to Renato Sanches (in the middle) with a nice pass, this one can deliever in a first touch pass to other coleague, making imediatley a two-against-one situation with any pressure from Atletico “4 midfielders” line. Than, and because the back three are all concentrated on the three Benfica’s “forwards” (2+1), the Benfica midfielder can make a variation to the left where Eliseu (left back) will appear without opposition (I am telling these because the Atleti deffence padron is to trap the zone where the ball is, so their right midfielder will try to move inside, leaving open Eliseu). I am telling this, not to make a critic to the Atletico’s deffence system, which by the way I am a fan, but because I think there is still things they can improve. One of that is compactness in all the moments of the game. Otherwise, I think with more quality in the decision making, they will suffer a lot. For example, I am thinking on a situation, that instead of André Almeida you have Lahm. Instead of the rookie Renato Sanches you have the “spanish quarter back” Alonso and instead of Eliseu, you have a tactical genius called Alaba. All of them think and execute faster than almost everybody in the game nowadays. So, I believe that that deffence system suffer more in those situations. As a Benfica fan, I was very desappointed with my team for not trying that spanish weakness. By the way what did you think about Benfica? There are a lot of new players not only in the starting eleven, but also in terms of experience. Would love if you could make an analysis on Benfica. Just to have a fresh eyed analysis. Congrats for this excellent website and I wish a great 2016 for you all. Thanks very much for your kind words. I agree that this Atleti team can improve in the defensive phase in the same way Bayern Munich can improve their positional play, nothing is ever perfect in football (other than Busquets). I really liked Benfica under Jesus but haven’t seen a great deal of them since then. They seemed to be very proficient in early build-up play in the game I watched for this analysis. I think they’ll get past Zenit in the next round of the CL. Maybe I’ll do a match analysis of them in the Champions League, especially if they make it to the quarter finals and play Bayern, Barca etc. As usual, beautifully written and makes it easy to understand. Love the defensive and pressing explanations. As an English fan, need to learn more about pressing! 🙂 Vielen Dank!